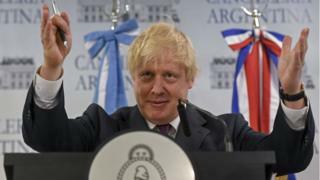 Foreign Secretary Boris Johnson has said he "probably needs" a plane to help him travel the world and promote the UK's interests. Cabinet members can use the RAF Voyager for official business but Mr Johnson said it "never seems to be available". Asked by reporters if he would like a "Brexit plane", Mr Johnson said he would - if costs were not "exorbitant". "The taxpayers won't want us to have some luxurious new plane, but I certainly think it's striking that we don't seem to have access to such a thing at the moment," said the foreign secretary. He added: "If there's a way of doing it that is not exorbitantly expensive then yes I think we probably do need something." Mr Johnson also questioned the drab colour of the Voyager, saying: "Also, why does it have to be grey?" Mr Johnson said the plane's multiple users mean it is difficult for senior ministers to book. "What I will say about the Voyager, I think it's great, but it seems to be very difficult to get hold of," he said. Other jets are available - one of which Mr Johnson used to fly to Russia in November - but the foreign secretary complained those planes had not been upgraded in almost 40 years. Tony Blair had plans for a prime ministerial jet - labelled "Blair Force One" - but the project was abandoned as a cost-saving measure by his successor Gordon Brown. Responding to Mr Johnson's comments, the prime minister's official spokesman said: "There are flights available for ministers when they need them. "The Voyager has been used on occasions when ministers have been carrying out business on behalf of the prime minister."